You want to learn to fly RC, but there are so many planes to choose from. How do you know which one to start with? 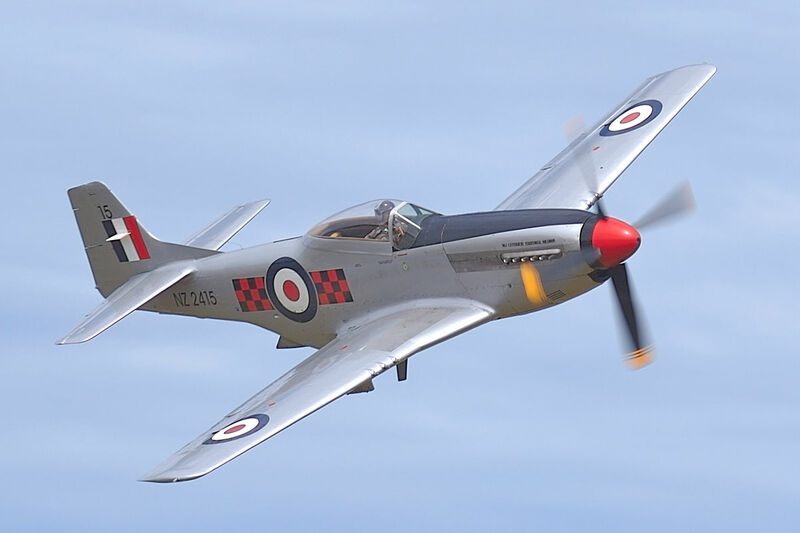 The reason we’re interested in RC flying is because we like airplanes, and who doesn’t like a P-51 Mustang, right? If this is your first plane, make sure you stuff a trash bag under the fuel tank when you set it up, so you’ll have somewhere to put all the tiny pieces after the first flight. A far better choice would be a slow, stable plane that gives you plenty of time to react so you can learn how to fly before it crashes. There are many airplanes designed with the beginner in mind. Sig Kadet Senior is an excellent example. This type of plane gives you a lot of time to think, so you don’t get into a panic. However, I’m not telling you to build a Kadet first, because the question is a little bit too complex for a single answer. You can compile huge lists of trainers. If you ask for recommendations most guys will tend to suggest whatever trainers they used. You may also get some suggestions based on people’s impressions of history. There was a time that I call the Golden Age of the 40 Size Balsa Trainer, from the mid 1970s to around 2000. During this time, most newcomers to RC were advised to get a wood kit to build a 40 size trainer, from one of the many companies who sold such kits at the time. There were lots of RC clubs, kit manufacturers, organized flight instruction one evening a week at the club field, etc. These were good times, but the kit manufacturers have mostly gone out of business, you can hardly find any 40 size trainers any more, and you have other options nowadays. Your best choice for a trainer depends on your individual circumstances. In today’s market you can buy just about anything you want pre-built, and fly it without doing any construction work. I like to think that you are reading my website because you are interested in building. But for now that doesn’t matter one way or the other because we’re just talking about the characteristics of the best aircraft for you to learn to fly. This advice applies whether you want to build or buy. Do you have access to an improved runway? Is it grass or pavement? If no runway, do you have a pasture with tall grass, or just a piece of wilderness? If pasture, can you get out there with a mower and make a strip? Is it always windy where you fly? How much clear airspace is available for flying? How big is your car, your home, your airplane storage area? Do you have access to a computer flight simulator? Most importantly, do you have help from an experienced RC pilot? Let’s assume first that you’re going to be a self taught maverick with no expert flying help. The number one consideration in this case is speed. You want a slow plane, and the slower the better. A glider with an electric motor would be a good choice. The reason is because I’m going to give you some flying advice in section 2 and you’re going to need time to think and remember it. If you’ve ever seen a thermal soaring glider, you know they go really slow. Low speed is what you need. Don’t worry, you can get your Mustang later. If you have a paved runway (abandoned parking lot, street in a defunct real estate development, or even a club field) you’ll want wheels or at least skids on the bottom to protect your plane. If you have a grass runway you can forgo landing gear because the plane can land undamaged on nice grass. If the grass is really nice, you can also fly a plane with real landing gear. If you are making your way in the uncharted wilderness, with rocks, bushes, and weeds, or even a cow pasture with tangled grass and cowpies, you don’t want landing gear because it will snag and cause more damage to your plane. In this case you may want some kind of skids. If you don’t have a lot of airspace above the landing area, you need a small plane. Bigger planes have more momentum and tend to keep gliding a long way, and they usually have a larger turning radius. Small field means small airplane. So far these have all been interesting points, but here’s one that’s really important. The size of your plane will have a considerable bearing on how much damage you can expect it to suffer when it has the inevitable bad landing. If you stand on the roof of a 3 story building with an ant in one hand and a horse in the other, and you drop both of them, you would expect the horse to have a very bad experience upon reaching the ground. The ant would simply walk away unharmed. A similar fate befalls model airplanes that have bad encounters with the ground and other objects. Big planes crash and break, but little ones just bounce. Let’s add up all of the factors for the self taught maverick. Assuming that you have unimproved ground and small airspace, you need a plane designed as a trainer, in the 30″ to 36″ class, with no landing gear. If you have access to a smooth patch of mowed grass, you can choose to add landing gear. If you add more airspace, you can move up in size just about indefinitely, as long as you stay in the mega-slow class of plane. But even with more airspace, if you go back to a wild unimproved landscape I would suggest that you also go back to the 36″ class to protect against crash damage in the event of snagging in a tree or hitting a bump or a rock, or even a clump of weeds. Obviously all of these considerations are contingent on your car, house, and storage space. Presumably you don’t need my help with that. If you live in a studio apartment and drive a Mini Cooper, you know what you gotta do. The good news is that if you are forced into the world of small planes because of your lifestyle, you’re still in the realm of easy training. This just leaves three items on the list I included at the beginning of this discussion. One is the flight simulator. If you can get access to one, do it. It will greatly improve your chances of success. The main reason is control reversal syndrome. When the plane is coming at you, you move the stick to the left and the plane goes to your right (its left), you get confused, you keep moving the stick left because you want the plane to go to your left, the plane spirals down, and it crashes. Find any way that you can to get over this problem before you commit to flying. If you don’t, then you’ll have to learn it in the air, which is why I tell you to get the slowest plane you can find, so you’ll be able to think and remember this issue while you’re flying. So, the point is that flight simulators are good, and so are RC cars and boats because they can teach you this important reflex without crashing. The other two items are wind and flight instructors. Obviously if you have a friend, or if you can make a new friend, who is a competent pilot, he can check out your plane, give you some flying lessons, save your plane moments before it crashes, etc. This is all very obvious. I’m a self taught pilot, so I know it’s possible. But it’s nice to get help, and of course it’s always nice to have friends. Flying is more fun with friends, too. Incidentally, my own experience of teaching myself is what inspired all of the advice I’m giving you now. I learned that even the “slow trainer” in the above photo would not survive in an unmowed cow pasture, high wind, or other adverse conditions in the hands of an inexperienced solo pilot. I achieved success only after I built a very lightweight 36″ balsa trainer that flies and lands super slowly. I learned in moderately windy conditions, which brings us to the last item on the list. Wind is annoying, it creates unpredictable conditions, and it’s generally a hazard to new pilots. Wind is a factor that should encourage you to get help from a good RC pilot. But if you still have no help, or you just want to do it solo, wind puts you back into the small trainer category again, regardless of all other factors on the list. Choose landing gear or no landing gear based on your terrain, but stay in the 36″ or less size. And remember the slower the better. All of this advice so far has been for the self taught RC pilot to choose a trainer aircraft. But if you have a flight instructor, the best choice is probably whatever plane he feels comfortable with. Go ahead and remember what I said about landing gear and rough terrain. But if this guy knows what he’s doing you probably ought to listen to his advice.